Courier jobs through the years. Click for big image. The standard question people are asking about this morning’s strong jobs report is whether it’s nothing more than so much holiday strength, which will vanish with the turn of the calendar to cold, cold January. The standard reply to that question has been, duh, the Bureau of Labor Statistics adjusts for that seasonality. But there are still doubts about how well they’re doing that adjusting. Tom Porcelli at RBC sent along this eye-catching chart which demonstrates why people might be having these doubts. It’s a chart of hiring in the sector known as “couriers and messengers,” a group that includes the elf workers that help deliver gifts to good girls and boys and coal to the naughty. You don’t have to look too hard at the chart to see what looks an awful lot like seasonality at work — these numbers spike every December and then fade immediately. 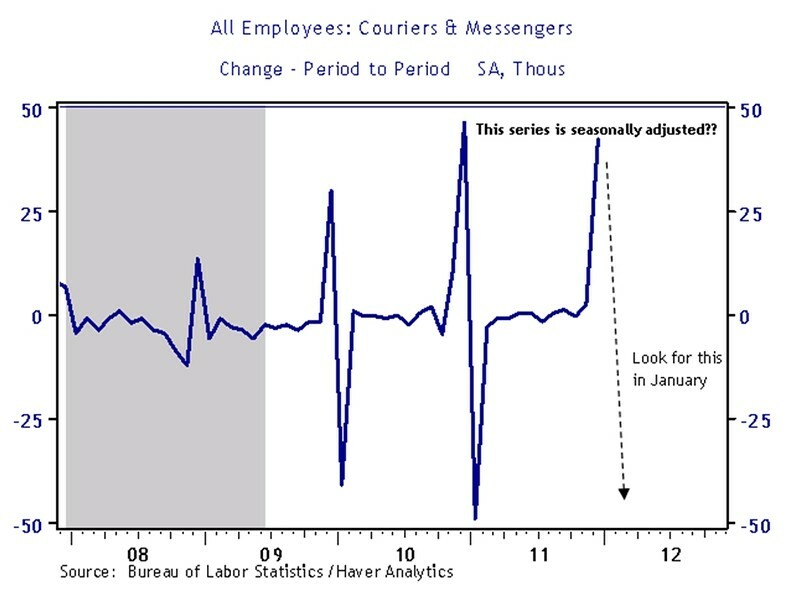 What we find peculiar is that the BLS once again looks to have failed to properly adjust for the seasonal hiring of holiday couriers. This series is actually seasonally adjusted yet every December over the past few years we see a surge in hiring in this space followed by a rather large unwind in January. This year in particular, a sizeable 42k jobs were added meaning we should see about the same number fall out next month. Accounting for this anomaly, today’s +212k (private sector payroll gain) loses a bit of its luster. Cardiff Garcia at FT Alphaville has been writing for a while about the problems with adjusting economic numbers for seasonality. If we see a drop in these jobs numbers next month, that question could gain more traction.